Every significant indicator — the number two farm system in baseball, a lucrative new television contract on the way after this season, expected positive regression for team cornerstones Starlin Castro and Anthony Rizzo, the financial health of the organization will dovetail with the emerging competitive window — points to excitement on the horizon for the Chicago Cubs. Unfortunately, that excitement does not matter for the 2014 squad. They’re a ramshackle team, with middling starting pitching headlined by the beautifully locked — and overwhelmingly likely soon-to-be former Cub — Jeff Samardzija, a possibly emergent bullpen, and a mix-and-match offense populated with players who would be bench guys or minor league depth on 26 or 27 other teams. Things don’t look good. Some luck could go their way, but it would be foolish to expect the team to wildly improve on their projected 73-89 record. Instead, expect another midsummer “Everything must go!” sale. Where does this leave Cubs fans? The season starts tomorrow, and pessimism is never fun with half a calendar year of losing ahead. We have little of substance on the field to root for, so we often have to look around the edges for those tangential things that make the Cubs and their surroundings unique. Here are some interesting storylines to help cope with the 2014 Cubs season. Palms love to be greased everywhere, but in Chicago, there’s a brighter spotlight on the back room dealings. The tradition of “What’s in it for me?” in the Windy City goes back a century or more, with charges of voting early and often, laissez-faire approaches to organized crime, sped-up building permit processes for buddies (always buddies, never friends, pals, mates), nepotistic political dynasties, and plenty of other things I never overheard my grouchy city employee father rail against after bad days (every day) at work. It’s all quite fascinating from a sociological, storytelling standpoint, if difficult to stomach if you care about things like “doing what’s right” and “efficient government” — who needs ’em when there’s money to be made? The West Wing, it is not. And so, in keeping with convention, making significant and necessary changes to one of the city’s oldest institutions, Wrigley Field, has been a torturous process of trying to cut laughably thick red tape armed only with nail clippers. What would normally be a simple, straightforward story of a business improving its facilities with its own money — after, of course, trying to secure public tax dollars for the job — has become a political epic of grandstanding, delayed promises, and histrionic City Hall meetings, all because the Cubs want to maximize their profits through renovating their literally crumbling private business and erect revenue-generating advertising around the ballpark, like a jumbotron in left field. In the way stand the rooftop owners across Waveland and Sheffield Avenues who have profited from the Cubs’ product for half a century or more. Yes, they are currently operating under a shared-revenue deal inked a decade ago before a Cubs ownership change, but the arguments they’re making are silly and fun to watch. Essentially, the rooftops have parroted themselves as everyday denizens of Lakeview (the neighborhood surround Wrigley) with only a cultural interest in preserving tradition and not upsetting the way of things, rather than a financial interest gained from unobstructed views of something they don’t own. In their corner is 44th ward alderman, Tom Tunney, whose “up your butts” outrage in the name of “the people” (a few rooftop business owners) is simply delicious. It’s pretty obvious which side of the argument I fall on, but this is interesting for everyone for the spectacle of bickering. Like I wrote above, you have to take a sociological, storytelling view of things to appreciate their absurdity in full. And 2014 looks to be the year when everything finally gets sorted, with the renovation tentatively, finally, scheduled to begin once the season ends. 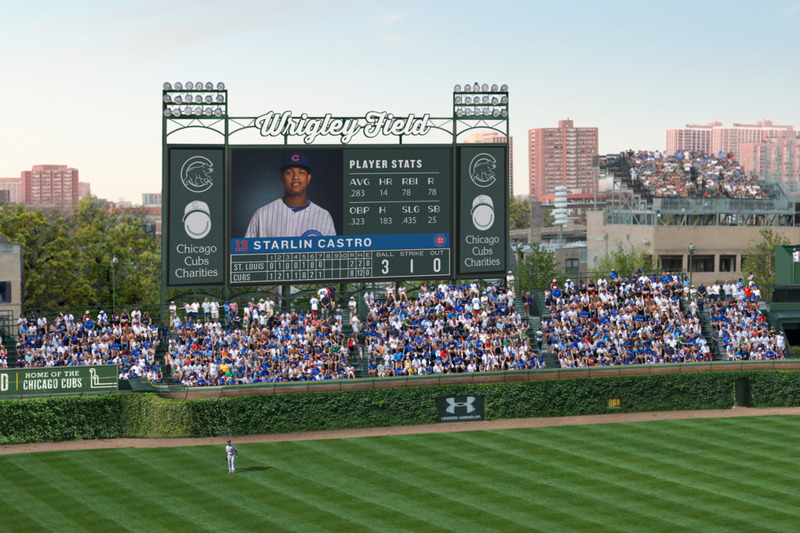 Wrigley turns 100 years old in 2014, and the Cubs have some fun stuff in store. I’m most excited for the 10 different throwback uniforms, each representing a decade of the ballpark’s history, the team will wear throughout the year. Visual variety is something the team has lacked in recent years, particularly since they reduced the number of times they don their blue alternates once preferred by pitcher Carlos Zambrano. The day’s uniforms are generally chosen by the day’s starter, and given ballplayers’ typical insistence on keeping things simple and overly superstitious thinking, it makes sense that they wouldn’t switch things up with any regularity. Still, from a fan’s perspective, that gets dull. Therefore, these corporately mandated jersey changes for each homestand will be great fun to watch. As you can expect, they aren’t all winners. The 1953 outfit is bland and too white, and the 1994 blues look like a high school team’s practice uniforms. The 1914 Chicago Federals jerseys, to be worn against the Arizona Diamondbacks on April 23, are standouts. They look like they’ve jumped from John Sayles’s Eight Men Out to the modern day. My favorites, though, are the 1978 road uniforms. The Cubs will wear them against the Cardinals on July 27, at which point the baby bears will likely already be playing spoiler. I’ll do my best to get to this game to see my team try to block their biggest rivals from steamrolling their way to the top of the National League, while wearing their glorious powder blue duds. Located a couple blocks north of Wrigley on Clark St., the Gingerman Tavern might be my favorite bar for several reasons. The last few times I went been there, they played The Clash’s debut album as they showed Animal Planet’s Too Cute on every TV in the bar, and they serve Jeppson’s Malort, Chicago’s grossest liquor and greatest thing to serve to out-of-towner friends. Plus, personal hero, Lawrence Arms bassist/vocalist, and Bad Sandwich Chronicles blogger Brendan Kelly is known to haunt (and tend) the bar from time to time. It’s a good place to catch a table with friends, and buy them stomach-turning shots. The Cubs’ number two-ranked farm system will likely graduate a few of its top prospects this year, including 21-year-old shortstop Javier Baez, whom Baseball Prospectus’s Jason Parks says may have “the best bat speed [he’s] ever seen,” and certainly the best he’s seen at the minor league level. Baez’s legend has grown to Greek myth levels this spring training, with his hyperventilation-inducing power and banning from certain backfields because he broke car windows with home run balls. He will start the year at AAA Iowa in order to work on his defense — he could need to switch to second or third base because of Starlin Castro’s place as the projected-to-rebound incumbent shortstop — and plate approach. Besides, if he were to open the season with the big team, procedural rules would cost the Cubs an entire year of contract cost control over him. It’s best to keep the prospect with the “best ceiling in the minors” for a year of his assumed prime than bring him up two months early in a lost season in which he will struggle against big league pitchers before making adjustments. Barring injury or ineffectiveness, he’ll be at Wrigley sometime in the summer. 2013 first round pick, third baseman Kris Bryant, also looks primed to make a case for a big league call-up by the end of the year. He tore up the notoriously pitching rich Florida State League after signing last summer, and will be in AA Tennessee, where most expect him to continue developing his tremendous power. Most expect him to be a right fielder when all is said and done, and circumstances at the big league level could force that move as soon as late summer. Those circumstances come in the shape of Mike Olt, who just made the team out of spring training after a 2013 season that saw him lose his big time prospect labeling because of a tear duct issue that caused him to not be able to see the ball. His doctors found a way to treat the issue, and he has looked like the player who was the Texas Rangers’ top prospect two years ago. He probably will not hit for much average, but his patience, plus-defense at third base, and 25-30 homer power make him a huge asset to an offensively challenged team if he can make the necessary adjustments. After his eye issues last year that cast into doubt his ability to ever play the game again, it’s nice to see him make the team with a chance to stick around as an important piece of the contending Cubs teams most expect in the next few years. The Cubs will again be sellers at the 2014 trade deadline. This means that anyone on the wrong side of 30, anyone playing well, and anyone unwilling to sign a longterm deal in order to stick around during the upcoming contention will be shipped out for prospects. 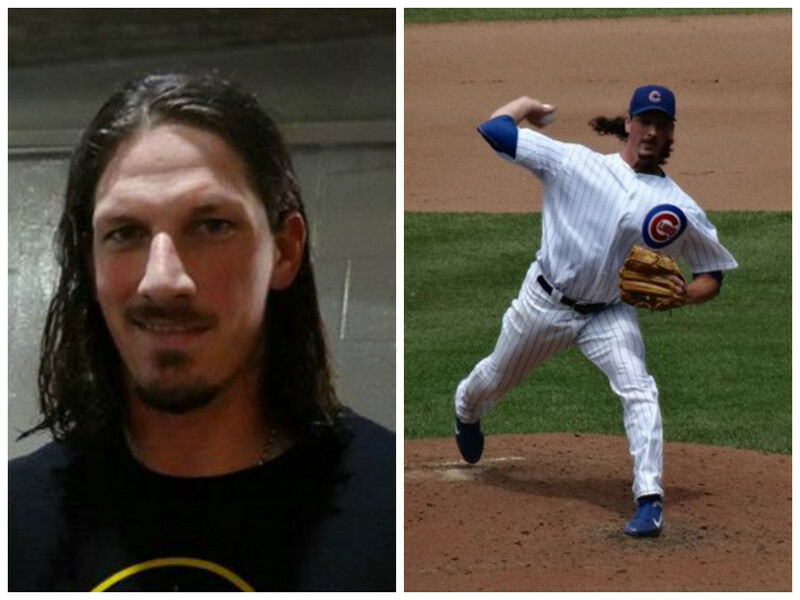 Candidates include ostensible ace Samardzija, Gold Glove (and miserably hitting) second baseman Darwin Barney, and recently signed starter Jason Hammel. These guys are not inanimate objects. They have feelings. They build relationships. Sometimes, relationships have to end via trade. Therefore, hugs happen. It’s something of a baseball tradition whenever someone gets traded in the middle of a game that the camera operators scan the dugout to catch every goodbye hug between now former teammates and coaches. In recent seasons on Twitter, #Hugwatch has popped up whenever such moments occur. It’s a nice, communal way to say so long to favorite players, laugh at their weird personal handshakes with their friends, and celebrate a guy’s impending move to a chance at a World Series ring.